Not yet the famous portrait painter and muralist he would become in the 1890s, the young, cosmopolitan Sargent painted between 1880 and 1882 a remarkable group of figure compositions inspired by two extended visits to Venice during those years. 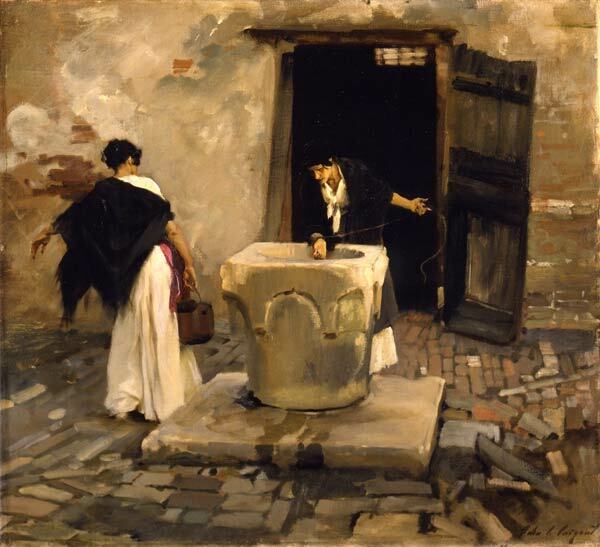 Rather than focusing on the famous picturesque monuments and canals of this luminous city, Sargent portrayed predominantly working-class women within the dark, mysterious enclosed spaces of unadorned halls, courtyards and back streets. These candid scenes of ordinary Venetian life, which went unappreciated by critics initially, reflect a masterful talent by an artist then only in his mid-twenties. From studying the work of such seventeenth-century old masters as Diego Velásquez and Frans Hals, Sargent had learned important lessons that reverberate in his muted palette of gray, black and brown, highlighted by touches of red and bright white, and the broad, decisive application of brushstrokes to define form, texture and light. Although seemingly informal, if not spontaneous, in both design and execution, Venetian Water Carriers is actually carefully conceived. Within a composition centered around rectangular forms (the door and its frame, the well and its base), Sargent subtly balanced the figure of the woman straining to carry a pail with the tilt of the door hanging off its hinges. With equal mastery he varied his technique, using exacting strokes of the brush, fluidly applied, to define individual pavement stones and building up rough layers of color to simulate the peeling plaster wall.